This Switch is no longer available for purchase. It has been replaced by the Eagle Aspen DTV3X4!!!! 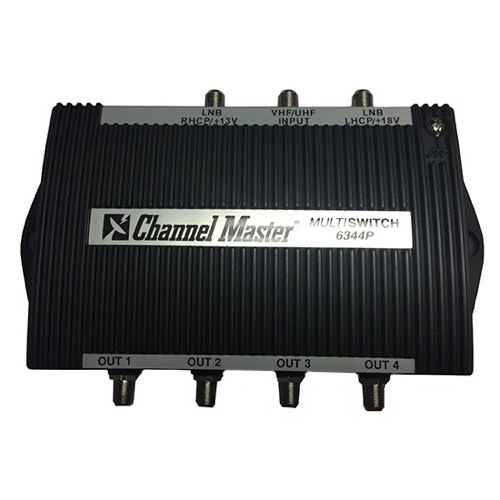 The JVI 35-STV34MA multiswitch is designed for the independent operation of four satellite receiver systems. This is used to provide satellite signals of either RHCP / LHCP or V / H polarization at four locations. The 35-STV34MA will also provide terrestrial VHF/ UHF signals diplexed on the same coaxial cable. These signals can be separated at the customer's outlet with either a JVI 35-STV48A or 35-SDX100 series diplexer. This device is built using surface mount technology which insures consistent reliable operation. Additionally, PIN Diode switching is utilized for faster smoother channel changes. Commercial Trunk Grade Digital QPSK Signal Distribution. State of the Art PIN-Diode Polarization Switching. Solder-Backed Case With >100 dB RFI Shielding. Solder-Sealed Case Offers Water Tight Protection. Ideal for small SMATV systems. Allows terrestrial VHF/ UHF and satellite I. F. Signals to be combined onto one cable. Amplifies the VHF/ UHF signal to compensate for insertion loss. Utilizes state of the art Pin Diode signal switching. Solder-Backed housing, that gives excellent EMI/ RFI shielding >-100dB. Manufactured with Surface Mount Technology, this allows for excellent Thru Loss, Return Loss, Isolation & Group Delay. UHF/ VHF: 8 ch., -46 dBc x-mod 20 dBmV/ ch.